Psychogenic nonepileptic seizures (PNES) are events that resemble epileptic seizures (ES) but without epileptiform activity and with psychological underpinnings . Clinicians have been fairly able to reliably distinguish PNES from ES based on clinical characteristics of the disease , but a definitive distinction between ES and PNES was not possible until an improved diagnostic tool – prolonged video-EEG (VEEG) monitoring – became available. Video-EEG allowed the correct diagnosis of PNES in a considerable percentage of patients with poorly controlled seizures. The diagnosis of PNES, referred to as hystero-epilepsy in the past (see Chapter 2), however, has existed for millennia. A survey of British neurologists in the late 1980s revealed that preferred nomenclature for unexplained neurological symptoms included “functional,” “psychogenic,” and “hysteria” . Scull cites 15 synonyms for PNES, including, among others, “pseudoseizures” (suggesting that there is something spurious or false about the events), “hystero-epilepsy” (indicating that the uterus is the origin of the nonepileptic events), “hysterical pseudoseizures,” “pseudoepileptic seizures,” and “psychogenic seizures” ; more recently terms such as PNES, “nonepileptic attack disorder,” and “stress seizures” have also been used. The emergence of new, less pejorative labels such as PNES indicates an increasing understanding and acknowledgment that the events are very real to the patient, witnesses, and physicians, but these events have different and variable pathophysiology or etiology as compared to ES. The term psychogenic nonepileptic seizures emphasizes the distinction between psychogenic and physiological nonepileptic seizures (or events) as seen in patients with migraine or other neurological conditions, sleep disorders or cardiac events (see Chapters 6 and 7). 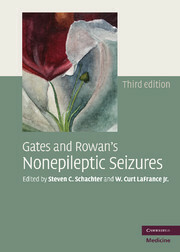 Consistent with the first two editions of this book and with research on terminology, the term psychogenic nonepileptic seizures is currently the most appropriate term for this condition, moving beyond the pejorative connotation that “pseudoseizure” carries; this term will be used throughout the rest of this chapter and book, where appropriate. The diagnosis of PNES is based on a history consistent with conversion disorder and confirmation of the diagnosis on VEEG. Monitoring reveals the lack of epileptiform EEG changes during clinical events associated with alteration of consciousness or motor, sensory, and/or autonomic phenomena; normal alpha rhythm (or no change in background rhythm) with or without the alteration of consciousness; and nonstereotypic nature of the events. Typically, no sustained response to antiepileptic drugs (AEDs) is found. A history consistent with PNES is also used in making the diagnosis [5, 6]. Some patients who have possible or confirmed diagnosis of ES are considered to carry a dual diagnosis of PNES/ES. disorders or multiple sclerosis, and stroke-like events (see Chapter 4). Further, the average delay in making the diagnosis of PNES is approximately 7 to 8 years [1, 5, 7]. Video-EEG is usually performed in patients who experience frequent or medication-resistant events that raise the suspicion of the clinician as possibly nonepileptic; patients with infrequent or controlled events, even when suspicious for PNES in description, do not usually undergo VEEG monitoring because of the high cost and low yield of such studies. Frequently, patients with poorly controlled seizures are referred to epilepsy centers for possible surgical evaluation or other interventions and are diagnosed with PNES only after the full evaluation including the VEEG is completed. Further, many patients undergo multiple VEEG evaluations as they may be searching for confirmation of a diagnosis or they may be referred to various centers for second opinions by physicians who are either unaware of the previous evaluations or diagnoses, or who are dubious of the diagnosis of PNES . Therefore, epidemiological studies of PNES are difficult to generalize and, by definition, can include only patients who underwent VEEG. Therefore, estimations based on the results of VEEG likely lead to underestimates of the true incidence and prevalence of PNES, as referring patients for VEEG monitoring depends on availability of the testing, vigilance of the referring and evaluating physicians and frequency of the events. Incidence is broadly defined as the number of new cases of a disease occurring per unit of time in a specific population. Only two true epidemiological studies of incidence of PNES were performed to date. The first study was performed in Iceland in the mid 1990s. In this country with a very stable population, all patients with new-onset seizures were considered for VEEG, which was performed in the only available laboratory . The authors of this study identified 14 patients ages 16 to 54 with definite PNES; the majority of these patients (78.6%) were women. The incidence of PNES was calculated as 1.4 per year per 100 000. The highest incidence of PNES was noted in the 15 to 24 years age group (3.4/100 000 person–years), with no patients above the age of 55 diagnosed with PNES. The incidence of PNES was highest in female patients 15 to 24 years of age (5.9/100 000 person–years). The authors estimated that patients with PNES constitute about 5% of all patients with new-onset seizures. For comparison, the authors estimated the incidence of epilepsy in the Icelandic population over 15 years old to be 35/100 000 person–years. The second study was performed in Hamilton County, Ohio . The authors found the mean incidence of PNES to be about 3.03/100 000 person–years, which is about 2 times higher than the incidence reported by Sigurdardottir and Olafsson . The highest incidence in the Szaflarski et al. study was in the 25 to 44 years age group (4.38/100 000 person–years) . The gender ratio of 73% women was similar to the Iceland study and to previous reports . This incidence of PNES was compared to the population incidence of epilepsy in Rochester, Minnesota of 44/100 000 person–years . Interestingly, the incidence of PNES in this study was twice that of the incidence of PNES in the Icelandic population, while the overall incidence of epilepsy in the US study was also higher when compared to that reported from Iceland. The similarities between the two studies indicate that the proportion of patients with newly diagnosed PNES may be fairly similar when compared to the overall incidence of epilepsy. In addition, the results indicate a fairly similar approach to the evaluation of patients with new-onset seizures/spells between the two studies. There also may be similar awareness and vigilance of the physicians regarding the possibility of a diagnosis other than epilepsy in patients with new-onset seizures. Finally, the study by Szaflarski et al. also found increasing incidence of PNES over the study period, indicating higher awareness of clinicians and familiarity with the diagnosis of PNES and of possibly improved access to VEEG in the US, assuming that the actual incidence was stable over time. proportion of intractable epilepsy among epilepsy patients of 20% to 30% (with 20% to 50% of these patients referred to epilepsy centers), and assumed 10% to 20% of patients referred to epilepsy centers would be diagnosed with PNES . Using the available data, the estimated prevalence of PNES was between 1/50 000 and 1/3000 or 2 to 33 per 100 000. Therefore, PNES is not a rare disorder and its economic impact related to medication and treatment expenses is estimated to be high, probably similar to the economic impact of epilepsy (see Chapter 3). Correct diagnosis and appropriate patient education may lead to a better understanding of the disease by patients and physicians and, therefore, may lower the economic impact by 69% to 97% . The reported prevalence of comorbid epilepsy in patients diagnosed with PNES varies considerably and was reported to be as low as 9% and as high as 63% [5, 15], with the higher number reported in one of the first studies reporting the results of VEEG in patients with medication-resistant epilepsy. In this study a total of only eight patients with PNES were identified (five had comorbid epilepsy). In an epidemiological study of PNES incidence, Sigurdardottir and Olafsson reported that 50% of patients diagnosed with PNES had comorbid epilepsy . This number appears to be very high as other recent studies reported much lower incidence/risk of epilepsy in patients with PNES. In the second incidence study reported above, only 16/177 (9%) patients were diagnosed with comorbid PNES and epilepsy , which is much more in line with a later estimate from a study that found coexistence of epilepsy in about 9.4% of patients with PNES . Therefore, it appears that about 10% of patients with PNES have comorbid epilepsy. Most importantly, in patients with well characterized epilepsy and abnormal EEG showing epileptiform discharges, PNES are still possible and should be considered if the patient is not responding to standard treatments. To summarize, the diagnosis of PNES is not uncommon, with about 5% to 10% of patients with spells/seizures having nonepileptic events. Clinicians should be vigilant in monitoring the description of events and particularly aware of unusual phenomena that may be atypical in ES but suggestive of PNES. Unusual characteristics of seizures or lack of medication response should prompt VEEG evaluation as a means of clarifying the diagnosis and designing an optimal treatment plan. Since the introduction of VEEG, epileptologists have had increased diagnostic capability, especially as regards the differentiation of ES from nonepileptic seizures, which has led to many of the advances in the understanding and treatment of nonepileptic seizures . Studies have identified heterogeneity in the psychological background and profile of patients with nonepileptic seizures. However, commonalities are found in many patients with nonepileptic seizures, including a history of trauma or abuse, psychiatric comorbidities, and family or social dysfunction. Studies have identified and proposed differentiation of discrete subtypes of nonepileptic seizures [18, 19]. For example, in his introduction to the second edition of this book, Gates divided nonepileptic events into a dichotomy – physiologic and psychogenic . The ability to classify patients within subtypes of nonepileptic seizures is important because there is evidence that subtypes are clinically relevant in terms of predicting outcome , informing nosology [18, 19], and, perhaps most importantly, potentially directing treatment [21, 22]. Studies of subtypes of nonepileptic seizures have utilized a wide range of methodologies and criteria. The following broad categories of subtypes that do not conform to existing psychiatric taxonomy will be reviewed: (a) classifications based on clinical semiology, (b) classifications based on personality testing, (c) classifications based on both semiology and personality testing, and (d) classifications based on suspected psychological mechanism/etiology. In this section, we survey the literature on classifications as an introduction to further discussions in subsequent chapters. and Adamolekun, Kretschmer postulated that PNES appear “…in the form either of a motility storm consisting of regression in a state of terror with hyperkinesis, trembling, and convulsing, or of sham death with stupor, immobilization, or a hypnoid state” [25; p. 498]. Similarly, Szondi described a polarity of paroxysmal drives oriented around the locus of perceived source of danger. Szondi postulated that PNES represented either a “protective drive,” with the epileptiform reaction as a response to perceived internal danger, or a hysteriform reaction in response to perceived danger in the external world . This basic classification of PNES as either hypermotor or atonic has survived within differing terminology (“catatonic” vs. “thrashing,” “convulsive” vs. “nonconvulsive”) and underlies modern classification schemes of PNES . Some early attempts to classify subtypes of PNES by semiology followed this theorized dichotomy fairly closely. For example, Meierkord et al. categorized spells as attacks of collapse and attacks with prominent motor activity . Interestingly, several authors have reported that two-thirds of patients with PNES have the hypermotor type and the remaining one-third of patients has the atonic type of spells [10, 26]. Other classifications of PNES included both motor and affective components of PNES. For example, Wilkus and Dodrill categorized PNES as mostly motor/limited affect and limited motor/prominent affect groups . Other semiology-based classifications of PNES introduced finer, but differing distinctions between types of spells. In an early study of semiology, PNES were characterized into four major patterns associated with the events: bilateral motor, unilateral motor, multiple behavior phenomena, or impaired responsiveness with no observable behavior . In contrast, Henry and Drury, in a study of whether stereotyped behavior during PNES represents learned behavior, characterized events as convulsive, hypotonic (“sudden falls, or leaning limply/leans onto a bed or other nearby support”), automatistic (“simple or complex movements that are symmetric or nonconvulsive”), or hypokinetic (“motionless or nearly motionless staring with unchanging posture”) . In a study of whether closed eyes during spells indicated psychogenic etiology in the context of seizure provocation, Flugel et al. used video and EEG to classify patients into the following three semiology-based groups: strong movements particularly of the extremities (similar to a generalized tonic-clonic seizure [GTCS]), spells with mild, less pronounced motor activity, and almost motionless unresponsiveness . In contrast, Gumnit and Gates mention the importance of differentiating PNES that resemble complex partial seizures (CPS) from those that resemble GTCS . In a review of cases described in other studies, van Merode et al. categorized PNES as resembling GTCS, resembling CPS, or resembling a combination of both categories . In one of the first studies to use cluster analysis (a specific statistical technique allowing for identification of “symptom clusters”), Groppel et al. classified patients with PNES via VEEG into three semiology-based clusters: psychogenic motor seizures, psychogenic minor motor or trembling seizures, and psychogenic atonic seizures . Reuber et al. in an outcome study involving long-term follow-up classified patients with PNES into the following groups: positive motor, negative motor, and purely sensory . However, a subset of recent studies has excluded PNES characterized exclusively by sensory phenomena from their classification schemes due to the limited sensitivity of scalp electrodes for detection of simple partial seizures [18, 34]. This problem renders the differentiation of ES and PNES, in the case of sensory or subjective PNES, extremely difficult, thus compromising the designation of these events as PNES versus ES. More recent studies have further expanded the number and complexity of delineations between types of PNES in order to better understand the natural history and pathogenesis of PNES. For example, Selwa et al. introduced a classification of PNES into six types: catatonic, thrashing, automatisms, tremor, intermittent, and subjective. This study was unique in that it focused on the utility of subtype with regard to outcomes, such as remission of seizures and discontinuation of AEDs . Although there are six subtypes in the proposed Selwa et al. classification, their study focused on comparisons between catatonic and thrashing, the two most conceptually opposite categories. Recently, Griffith et al. modified the Selwa scheme to a four subtype scheme, consisting of catatonic, major motor, minor motor, and subjective . The Griffith et al. classification is more parsimonious and resulted in better interrater reliability than the Selwa et al. scheme [18, 19]. “hypermotor” events, by identifying three to four distinct subtypes of PNES, with the most useful of these schemes demonstrating good interrater reliability; these new classifications schemes have been reported to be related to outcome (see Section 5). Some investigators have used psychological testing, especially personality testing, to identify subtypes of patients with intractable seizure disorders. The most commonly used measure of personality and psychopathology in both ES and PNES populations is the Minnesota Multiphasic Personality Inventory (MMPI) [35, 36]. Other personality measures have also been used in these populations [26, 35]. For example, in a sample of presurgical patients with intractable seizure disorders, a subset of whom (about 20 of 90) were likely to have PNES or both PNES and ES, King et al. identified three groups based on personality profiles (in order of greatest frequency): minimal psychological complaints, generalized clinical elevations (high psychological complaints), and intermediate elevations with a tendency to emphasize somatic complaints or depression . Several authors have emphasized the heterogeneity of personality profiles among patients with PNES [35, 37, 38]. For example, studies have found that a majority of patients with PNES have personality abnormalities on psychometric tests [26, 39], but there is not a single characteristic personality profile that can be attributed to these patients . Barrash et al. analyzed MMPI profiles of patients with PNES and identified seven discrete personality clusters: histrionic, depressed, nonaffective serious psychopathology, disinhibited, decompensated, somatisizers, and asymptomatic . In another study involving personality testing with the MMPI, Gumnit and Gates analyzed interviews, MMPI, and projective testing results among patients with PNES. They found five underlying etiology-based subtypes based on suspected etiology or function of PNES: (a) psychological distress-emotional conflict, (b) inappropriate coping mechanisms, (c) misinterpretation of normal physiological stimuli, (d) psychotic behavior, and (e) an epileptic aura or seizure followed by PNES. They also reported that these subtypes were useful for selecting patients for appropriate treatments . Of note, the model employed by the Diagnostic and Statistical Manual of Mental Disorders (DSM) has been criticized by some authors [26, 42, 43]. For example, Reuber et al. favored a dimensional system that would consider personality disorders as extremes on a continuum of common personality traits. These authors also noted considerable symptomatic and behavioral overlap and poor interrater reliability between DSM personality disorders . In addition, Reuber et al. and other investigators have criticized use of the MMPI for categorizing personality subtypes, especially among inpatient groups. The same authors stated that the MMPI is difficult to interpret because it simultaneously measures both personality characteristics and psychopathological syndromes, such as hypochondriasis and conversion . In contrast to studies utilizing the MMPI, Reuber et al. used the Dimensional Assessment of Personality Pathology-Basic Questionnaire (DAPP-BQ ) to measure personality in patients with PNES as compared to patients with ES and healthy subjects. They found three distinct “typical pathological personality profiles” via cluster analysis (in order of size): similar to borderline personality disorder, overly controlled personality, and similar to avoidant personality disorder. There has been increasing attention in behavioral medicine paid to the importance of measuring “normal” personality traits. Cragar et al. emphasized the relationships of normal personality traits to health status, health outcomes, and behavior patterns . Moreover, normal personality traits, such as optimism and pessimism, have been found to be relevant to investigations of both etiology and outcome in both medical and psychological disorders [45, 46]. Cragar et al. studied normal personality traits in patients with PNES by means of personality dimensions derived from the five factor model as measured by the Revised NEO Personality Inventory (NEO-PI-R) . Using cluster analysis of both MMPI and NEO-PI-R results, Cragar et al. found three personality clusters in patients with PNES: depressed neurotics, somatic defenders, and activated neurotics . It is therefore clear that classification of PNES by personality testing has underscored the heterogeneity of personality profiles in patients with PNES. Although some earlier work focused on pathological personality profiles, a more recently employed approach has been to investigate personality traits/dimensions/clusters, which may inform etiology and outcomes. A few studies have combined personality, psychological testing and semiology in identifying subtypes of PNES. In perhaps the best example of this approach, Wilkus and Dodrill classified patients with PNES into the following groups: (1) mostly motor and limited/none affectual and (2) limited motor/prominently affectual. These two PNES subgroups had different composite MMPI profiles; moreover, 76% of patients in the study could be classified into one of these two groups . By simultaneously considering/classifying both behavioral and affectual aspects of the presentation of PNES, the classification of PNES by both semiology and personality testing may represent an important evolution in the classification of PNES. Some investigators have classified patients with PNES via behavioral and interpersonal factors believed to contribute to the development of PNES – in other words, by etiology or suspected psychological mechanism. On a patient-by-patient basis, PNES may have a single-factor or multifactorial etiology; that is to say, in a given patient, PNES are believed to manifest from one or more of several distinct causal pathways [48, 49]. Ford identified several factors that may individually or jointly contribute to the etiology of somatoform disorders, including: (a) secondary gain, (b) behavioral manifestations of ineffective communication/inability to adequately identify and express strong emotion, and (c) disturbed family systems . Studies of patients with PNES have produced similar findings related to etiological factors (i.e., interpersonal, communication, and/or family problems). For example, Lesser summarized the etiological factors of PNES described in the literature as follows: (a) interpersonal, (b) intrinsic emotional problems or internalized conflicts (e.g., somatization, dissociation, posttraumatic stress), (c) psychosis, (d) personality disorder, and (e) cognitive difficulties or history of head trauma . Similarly, Alsaadi and Marquez classified PNES by suspected psychological causal pathway, while emphasizing that all PNES function as a coping mechanism . They classified the etiology of PNES as follows: (1) caused by misinterpretation of physical symptoms, (2) the result of psychopathological processes (e.g., somatization, dissociation), (3) response to acute stress (in patients with absence of psychopathology), and (4) reinforced behavior pattern in cognitively impaired patients. On the other hand, some authors have conformed more closely to psychodynamic theory in classifying patients with PNES by etiology. For example, one group of authors described four “psychodynamic pathways” to PNES: (a) history of childhood physical or sexual abuse, (b) recent sexual assault, (c) multiple life stresses that overwhelm coping abilities, and (d) panic attacks mistaken for PNES [51, 52]. These authors noted that for all of these categories, the manifestation of PNES was often triggered by recent trauma. Other studies conformed more closely to formal psychological diagnostic categories and processes. For example, one study identified six categories, or “symptom patterns,” of patients with PNES, based in part on the most effective psychotherapeutic interventions used with each group . Rusch et al. 's findings were reformulated by LaFrance and Devinsky as the following: (1) anxious, (2) abused (subclassified into 2a – abused [borderline personality disorder] and 2b – afraid [as in posttraumatic stress disorder]), (3) somatic, (4) dysthymic/depressed, and (5) mentally retarded . Classification of PNES by suspected etiology brings into focus common risk factors, such as recent trauma, and the multifactorial nature of the development and maintenance of PNES. Examining elements that may explain the differential effectiveness of psychotherapeutic interventions with subgroups of patients with PNES may inform our understanding of nosology. essential for correct diagnosis. A focused, symptom-oriented approach alone may lead to incorrect diagnosis. Description of the events obtained from the patient may be very sketchy or plainly inaccurate. Therefore, a detailed description of the event(s) from witnesses may be of significant value. Information about duration of the events may be the first clue to the correct diagnosis as PNES are usually prolonged, lasting sometimes more than 30 minutes . Further, seizure precipitants and the presence or absence of certain phenomena, such as prolonged waxing and waning course of the events, screaming, hearing but not being able to respond, ictal eye closure or crying, asynchronous or asymmetric extremity movements, pelvic thrusting, etc. may be helpful in coming to the right diagnosis. Further, the presence of EEG abnormalities including epileptiform discharges is not necessarily indicative of epilepsy  (see Chapter 4). The differential diagnosis of PNES also includes physiological nonepileptic events. These are usually paroxysmal events with physiological explanation. These etiologies include syncope, nonepileptic myoclonus, dysautonomia, and various sleep disorders (parasomnias), including sleepwalking, confusional arousals, and REM sleep behavior disorders. This list also includes other neurological phenomena, including transient ischemic phenomena and migraine, and non-neurological phenomena such as organic hallucinations and psychosis-related, e.g., to medication or substance toxicity. Syncope, especially convulsive syncope, is likely the most frequent physiological phenomenon that is confused with PNES. Overall, convulsive syncope is a relatively common event. In one study of unselected blood donors, convulsive syncope occurred in 0.03%. The donors frequently experienced convulsive tonic extensor spasm(s); other epileptic phenomena simulating epileptic seizure occurred less frequently. Up to 11.9% of these events were associated with convulsive phenomena. Further, the authors did not find any significant differences between the “early" and the “delayed" responses . In another VEEG study, 10 of 22 syncopal episodes precipitated by cardiac arrhythmias were associated with regular or irregular tonic movements. Although generalized EEG changes were observed in some patients (usually generalized slowing), no ictal or interictal epileptiform discharges were noted . Therefore, in patients with syncope or when the description of events is not clear, a detailed cardiac evaluation, including either 24-hour Holter monitoring or even up to 30 days of cardiac event monitoring, should be considered. Figure 1.1 depicts the EEG and EKG of a patient who experienced vasovagal syncope in response to hyperventilation. Generalized EEG changes are noted in response to CNS hypoperfusion. Transient ischemic events that may mimic epilepsy include not only transient ischemic attack (TIA) but also migrainous phenomena. As these events are fairly frequent, and migrainous sensory phenomena that are not associated with headache may be sometimes difficult to distinguish from simple partial sensory seizures, clinicians need to utilize detailed clinical history to reach the diagnosis. With the incidence of TIAs approximating 83/100 000 person–years  and the incidence of migraine averaging in males between 6.6/1000 and 10.1/1000 person–years and in females between 14.1/1000 and 18.9/1000 person–years , there is a high chance that neurologists will encounter several patients per year that have somewhat unusual presentations of the respective disease that will require differentiation from ES or PNES. Physiological events that require differentiation from PNES and ES are further described in Chapters 6 and 7. It is very important for the practicing clinician not to assume that patients with unusual events have PNES without proper evaluation, as there are many other clinical entities that mimic ES and PNES that need to be excluded based on thorough clinical history and supplementary testing. Figure 1.1. EEG/EKG tracing of a patient with history of events of loss of consciousness associated with myoclonic jerks (grey vertical lines represent 1 second markers; each panel represents 30 seconds of recording). While the patient undergoes video-EEG monitoring he is asked to hyperventilate. Panel A shows clear tachycardia ([25-A1] channel) and gradual prolongation of the QRS with pause lasting approximately 20 seconds (extends to panel B). Generalized slowing of the background EEG is noted with a burst of generalized theta/delta activity without epileptiform discharges in the first part of panel B followed by suppression of the EEG activity and then gradual recovery (not shown). multifaceted and includes the interaction of predisposing, precipitating, and perpetuating factors [65, 66].